Here's the ironic part: I wasn't supposed to be at the game. I'll get to that in a moment, but first I want to clear some things up. I haven't spoken or made an appearance publicly since the night all the drama happened and I won't, at least anytime soon. I won't tell you where I live or what my job is now because it doesn't matter. But what I will say, is that I still love my Cubs and I moved on long ago. Sorry to burst your bubble, but I lead a very normal life. I work. I come home, maybe have a beer or two while enjoying my favorite thing: baseball. I have friends. I call my parents to say "hi;" Dad's retired now, so he's got a lot of time on his hands to talk about our team. I didn't move to London, India, Alaska or any of the other crazy places some people suggested. I didn't have plastic surgery, either. That one made me laugh. I met the love of my life years ago and we have two beautiful kids. She's amazing (but not a sports fan) -- and we still laugh about how she asked, 'what's the craziest thing to happen to you?' on our first date. I remember saying that it was a long story. Anyway, my oldest says Anthony Rizzo is his favorite player and my youngest has an extra-small Kris Bryant shirt. I'm trying to raise them right (we don't say White Sox in our house either). Sometimes I think back to my life 12 years ago. So much has changed. Honestly, the first couple months after October 14, 2003 were very difficult. I hated the attention. I hated turning on SportsCenter. I hated reading what fans or even reporters were saying. People looked at me strangely. Imagine being at the mall, out to dinner, on the street and getting glares that end with a squint and a tilted head. It's not fun. But, like anything in life, the hard times passed. A new season came and went, and then another, and then another. People got bored of reminding themselves of my honest mistake. It's like in high school, when you had an embarrassing moment and the whole student body knows about it. You're the talk of the hallways -- until something else happens. Then you're off the hook. I shouldn't have been on the hook to begin with, though. Like I said, I shouldn't have been at the game. I worked a boring desk job at the time and, like most 26-year-olds, I didn't have much disposable income. I was dying -- dying -- to go to a playoff game but had no way of getting there. I went to a bar outside of Wrigley to watch Game 3 of the Division Series against the Braves that year (Mark Prior beat Greg Maddux, 3-1) with a friend, but that's the closest I was going to get -- or so I thought. The morning of the NLCS Game 6, two days after we were embarrassed in a 4-0 loss in Florida, my boss called me into his office. I always liked going in there because he had a big framed black and white picture of Ernie Banks hanging over his desk. I asked what he needed. All he did was smile and open his desk drawer. I nervously reached out and held a ticket stub. Wow, I thought. This is, like, right on the field. It's literally feet away from Moises Alou! Apparently my boss caught wind that I was the biggest Cubs fan in the office and he wanted to reward me for hard work. I thanked him a million times. I knew he was a season-ticket holder in these crazy-expensive seats and also knew he stopped going to games in mid-September that year because his wife was nine months pregnant. He gave his other ticket away to a friend of a friend's neighbor or something -- and that person actually never showed up to the seat. I didn't care that I was alone. I traded pleasantries with a nice guy, a firefighter named Pat and his friends during batting practice, but I just preferred listening to the radio broadcast during the game anyway. I don't remember a whole lot about the play. It was bizarre listening to the broadcast as it unfolded and, ultimately, led to chaos. The foul ball came down fast and I lost my spacial awareness. I knocked into a couple people around me, including that guy Pat, and then things just kind of went numb. The ball knocked off my hands and the next thing I knew, I saw Alou flipping out. I knew things were going to get pretty bad, but not as bad as it got. People started swearing at me. People threw beers on me. My head was spinning, I was sticky, upset, confused, agitated, angry, scared ... and alone. A reporter came over to me and asked if I knew what I had done. I said no comment a couple times to get him away from me. The booing kept hitting me like a ton of bricks and thankfully security took me down to safety. I wasn't spared from the moment totally, though. It was the worst night, week, month, stretch of months of my life and I wouldn't wish it upon anybody. It still stings. We should've won the game. And here's the worst part -- even after the unfortunate mishap that involved Luis Castillo lifting a pop up down the leftfield line, right at me, and fans reacting like any human would in that situation, we could've stopped the bleeding. 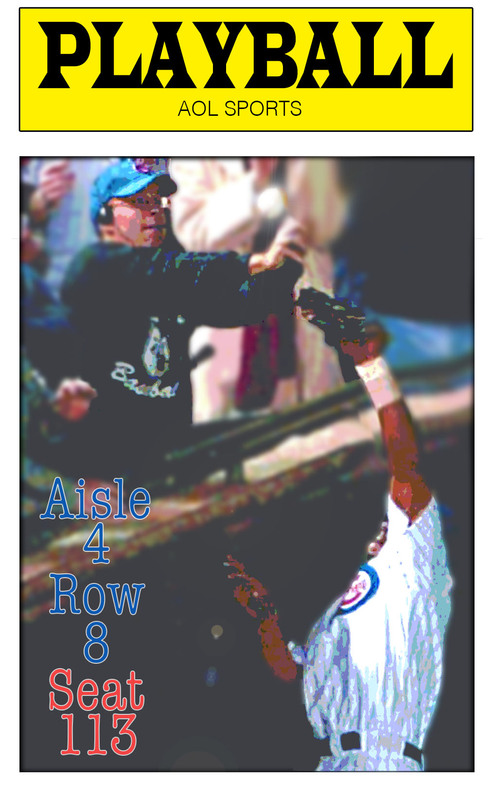 The so-called Bartman Play didn't define that game. Whatever. We should've won Game 7 too. It just didn't happen. One secret that I will reveal here: I cried that night. I won't elaborate because, like I said, I've moved on. It's nice to know some fans are moving on too. They even invited me to the Wild Card game. I appreciated the gesture, but I liked the idea of watching from my couch a lot more than the attention. Something about this year is special. I clenched my fists and raised them in the air as the Cubs closed out the Cardinals on Tuesday night, earning a spot in the NLCS. I love Jake Arrieta, whose fire reminds me of Mark Prior or Kerry Wood when they had their dominant stretches. I love Maddon, the youth, the chemistry, but most of all I love how Wrigley is buzzing. I still think it's the best place in the world. Maybe I'll go back for the World Series, if we make it that far. I'm not scared anymore. Plus anyway, you won't recognize me with contacts, some salt-and-pepper gray hair and an added 20 pounds. Maybe I'll give you a high-five in the upper deck. Maybe I'll stand in front of you on the beer line. Maybe I'll be the one with the kids who won't stop begging for more cotton candy. Maybe I'll be the guy all choked up if they clinch the pennant. Hell, you might even hug me in a blissful moment of excitement and joy. You'll just never know it's me. I'll be just another fan, just like I always was. I didn't let anybody know it, because those are the types of games where you lie to your skipper and say you feel great. I tossed 130-or-something pitches in my last start of the regular season and I sure as hell wasn't going to take myself out in this spot. So, I kept battling in the eighth, over 100 pitches, and Luis Castillo isn't giving up. Foul ball. Foul ball. Foul ball. I need five more outs to get us to the World Series. Or, better yet, I told myself, one more out and we're one step closer. I fired in a 3-2 fastball on the outside corner and Castillo lifted it to the left field line. Moises has a chance, I remember thinking. One more out then. Only, the ball hugged too close to the stands and I see a scrum of people reach up and block Moises' attempt to snag the ball. It took a second to register what had just happened, so stared blankly. I then pointed over and yelled in the direction of the ump, maybe hoping we'd get an interference call. Nothing transpired, except Wrigley Field became a war zone of boos. It wasn't distracting, but it sure as hell changed the atmosphere. That place went from excitement to panic in one pitch. Have you ever seen a foul ball do that to a stadium? I don't blame Steve Bartman. The truth is, if anything haunts me about that game, it's the 0-2 breaking ball I left over the plate to Ivan Rodriguez. That hit brought home the first of eight runs that inning. Three-run lead, gone. It's my job to get out of that inning. It never happened. It all happened so fast too. Between the Bartman ball and them tying it up, it was, like, six pitches. Six pitches and next thing you know, it was over. I always had my spot in the dugout, right there in the corner near the steps. That's actually the reason I didn't even see the play. Wrigley Field's dugouts are placed in a way where you have some blind spots deep along the foul lines or stands -- and the ball was hit into one of those pockets. I tried to make way to see it, because it was such a big at-bat. But I missed it. I watch the tapes back and I just feel bad. I felt for us, I felt bad for him. It was just so unfortunate how it all unfolded. Think about that guy. You go to ballpark to enjoy a ballgame, not knowing that four hours later, you'll be receiving death threats. I felt a tremendous amount of compassion, actually to the point that I wanted to win and have Bartman sit next to me in the ticker tape parade. But, life is full of disappointments. That was one of those moments for myself and a lot of people. I didn't think Alou had a chance in hell at that ball. I can't tell you how many times I've stood there in that bullpen, watching foul balls get lofted over there to him, and nothing. The guy couldn't jump. He was almost 40, so, I mean, it wasn't his fault. But I barely gave that ball a second thought. I gave it a peak, but I was already headed back to the warm-up rubber when the ball was in the air. My first reaction to the play was that I couldn't believe my eyes -- Moises got his glove over the wall and on the baseball. I didn't even initially realize that a fan interfered. When Moises started freaking out on the field, I thought it was because he hurt himself leaping. Then I saw him pointing, yelling at the crowd. I saw the way the fans were reacting, then it was obvious. That's why it's funny when people say I had the best view in the house. I guess I did, but I really didn't comprehend what happened right away. At the time, I will admit, I didn't think twice about what that guy was going through. I didn't care about him! All I was worried about was that Moises Alou didn't catch the ball and it was foul. Then I just approached the rest of the at-bat like I always did -- just get on base. After I did, it kind of felt like a movie. The whole ballpark, you could hear a pin drop. But to us, all we were thinking was the World Series. The fan gave us an extra chance, and we were happy. But after, we all kind of moved on. All we were thinking about was the Yankees. But now, I never want to think about the Yankees. I do, though. All the time. I've been trying to move on from that night at Yankee Stadium for six years. I couldn't escape that video of me backing up, backing up, panicking and dropping that pop fly that I've caught one million times before. I still can't. My friends all the time tell me, "Luis, your career is so much more than one play. Thirty-five-game hitting streak! Three gold gloves," they say. Honestly, I wanted out of New York the moment that happened. Never wanted to have to deal with those fans again. I was their Bartman. Now, I think about that guy a lot. I wish I could shake his hand, let him know he's not alone. I just hope he's doing better than I am. I only have one regret. And it's the reason I get so mad when people ask me about the play. The words I yelled at him -- ones I can't repeat. The looks I gave him the rest of that inning. I don't think the cameras caught it, but I was so mad, I just kept staring over -- we made eye contact two, three times. I remember being so mad, wanting him to feel that pain. Making sure he knew what he did wrong. It wasn't until months later that I realized exactly what I might have done to the guy. What if I reacted differently? Maybe told him not to worry -- give a thumbs up, something. I don't know. But I couldn't help it. I didn't even talk to my teammates the rest of the night. Just went home and booked my flight back home -- I was so mad, I gave up. I assumed we would lose Game 7. People ask all the time what the situation would've been if I never reacted. I'd love to be able to say "Oh, we will never know." Because I do know. I've had the same dream three different times in my sleep after I stopped playing. I go to catch the ball, he hits it away, I just walk back to left field. Then you know what happens? Prior strikes out Luis Castillo and then gets out of the inning. Then we bring in Borowski to save and we're going to the World Series. I celebrate with the fans in the outfield by that wall, high five them, smile and laugh. But I look at the guy, Bartman. He's so happy, jumping up and down. Getting hugs from the people around him. He takes his cell phone, calls somebody, yelling, laughing so hard you can see tears down his face. Wins, losses, whatever -- I experienced plenty of both when I played. But the way that guy felt -- that's what I wish I could change. People forget we had a Game 7. I don't. One of the biggest moments of my career was watching that awful inning unfold and putting it on my shoulders to make it all go away. It was my job to win the deciding game and get us to a World Series. I remember going into the clubhouse before Mark went out for the eighth inning, actually. I went to get a drink and I saw guys putting up the plastic over our lockers. That still hurts. We just blew it. Everything fell apart. And I'm not just talking about that inning or that play or whatever. I'm talking about what happened the next game too. I let everyone down, but nobody blames me. It's not fair. For some reason, it makes me feel even more guilty that everyone blames that fan, but not me at all. And I'm the one who gave up seven runs in the biggest night of the year -- or in the Cubs' case, the century. I always say that the best sound I've ever heard was me hitting the three-run homer to tie it in that stadium, and the worst sound I've ever heard was the Marlins celebrating. It was horrible. Our mentality was the same as it always was: Just get on base, do the little things, and we'd eventually be in good shape. But against Mark Prior that night, nothing was working. I mean nothing. Before that double off him in the eighth, we had, I think, three hits. No real threats whatsoever. But when we suddenly had a guy in scoring position, I saw the mood change in the dugout. Guys were on the top step -- we had some life. I remember Luis Castillo telling me after the game how the Bartman play relaxed him at the plate. Even though we were still down, five outs from going home for the winter, he said it felt like all the pressure shifted to them. After that AB, we had our table setters on for the heart of the order. And everyone knows how it went down from there. "39,577 at Wrigley Field in Chicago, for Game 6 of this National League Championship Series. On this October 14, 2003. It was on this date in 1908, 95 years ago today, that the Cubs defeated the Detroit Tigers 2-0, to wrap up their second straight World Series championship. With a victory tonight — as he said, he did not go around on the pitch there — with a chance to win their first title since this day, 1908." Not bad layering, but we weren't able to script what happened shortly thereafter. I've never seen anything like it -- and still haven't. There were just so many incredible stories from that night -- including running into Michael Jordan -- that I'll never forget. People say the whole Bartman incident was created by "The Machine." You know, the media scrutiny. Maybe we're a little to blame. If you play back the broadcast, I make a comment that seemed innocent at the time, wondering how someone could not let Moises Alou do his job. "Why? I'm surprised someone hasn't thrown that fan onto the field." We didn't think it'd get as bad as it did. A lot of years in baseball -- a lot of relationships. I never tried to work up too much emotion. Never tried to bring feelings into it. Coming out, talking to umpires -- that's one thing. But never let those types of things affect the way I managed. And that was true that night. During the game, it was just another play for us. But after? That was tough. The kid made a mistake, but come on. It was a foul ball, and Alou probably would've missed it anyway. I mean, at the end of the day, I get it. They haven't won in forever. But to pin it all on that guy for all this time? It's the saddest thing I've seen in baseball.